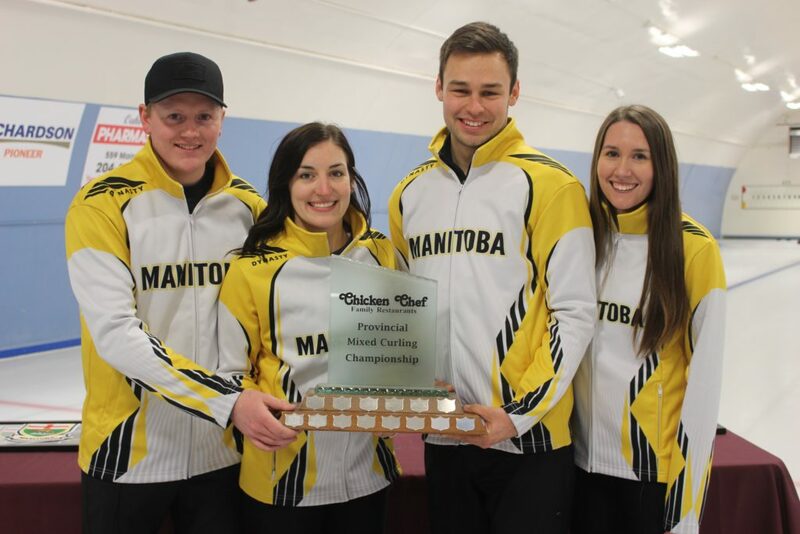 Team Braden Calvert (Assiniboine Memorial Curling Club) has won the 2019 Chicken Chef Mixed Open Provincial Championship held at the Springfield Curling Club from March 28-31, 2019. The game was tied at 2-2 after the fourth end break. Calvert took the lead scoring a deuce in the fifth end and a steal of one in the sixth to go up 5-2 over Chambers. Chambers scored two in the seventh end and stole one more in the eighth to force an extra end. Calvert scored one point in the extra to win the game 6-5. Chambers earlier defeated Travis Bale in the semifinal 7-2, while Calvert defeated Wes Jonasson in the other semifinal 6-2. Calvert and his team of lead Melissa Gordon, second Kyle Kurz, and third Beth Peterson will represent Manitoba at the 2020 Canadian Mixed Curling Championship from November 4-9, 2019, at Foyer des Loisirs et de la Culture in Saguenay, Quebec. For more information about the 2019 Chicken Chef Mixed Open Provincial Championship, please contact Krysten Karwacki at [email protected].